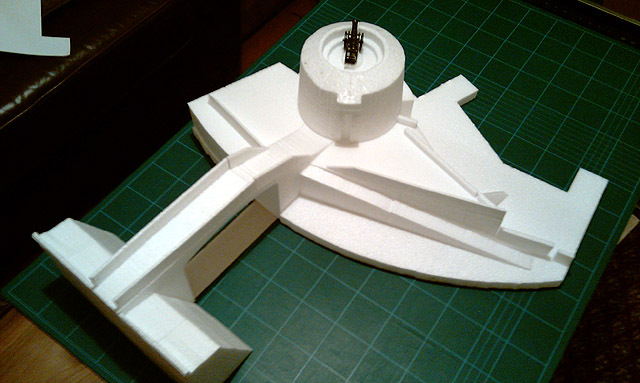 The Seapoint Martello Tower & the Ordinance Bridge over the railway - this would go well on a layout with DARTs! I have always connected the towers with the railway, I'm from Monkstown, therefore spent many days at Seapoint- if you were there you saw trains go by! It stuck! The towers are part of our Eastern coast line, they are nice and interesting structures (questionable use they were intended for though), and some not kept well. The type and quality of the stonework was carried on through to the early railway works and the harbour, in my mind there all connected! 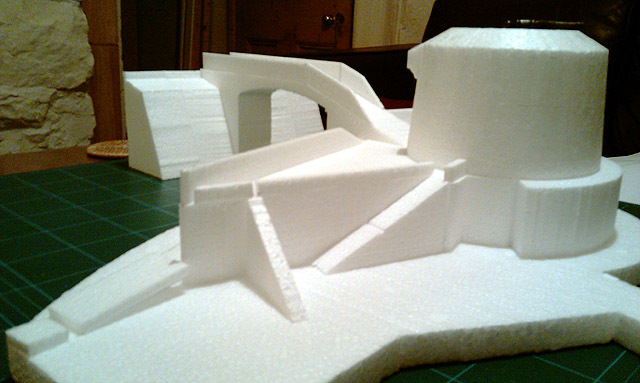 These are a few shots of a test cutting, I just used white aero-board to work it all out. 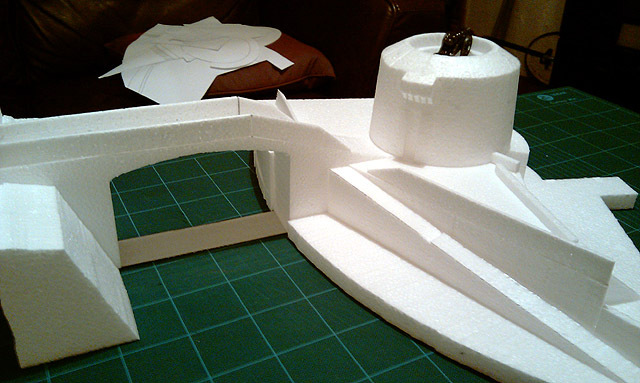 The final one will be in blue foam with a resin reinforced surface. 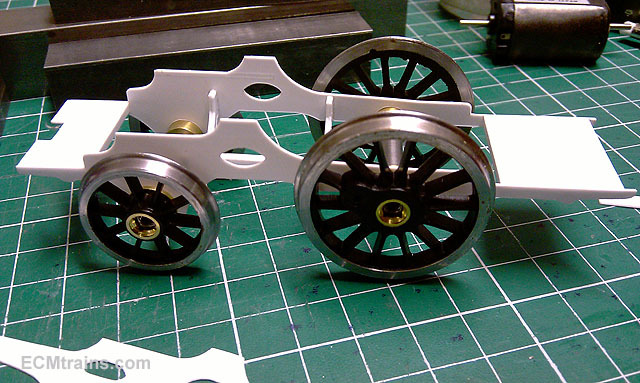 I have taken a bit of a licence on the design, if I worked to scale the model would be quite large and this design is to fit Baseboard Dave's display table with a curved track. The bridge is wide and high enough for two tracks, cantenary wires and posts. I'm not sure to what level this will be finished to, its early in the project and I'm just going to see what happens. superb work...canr wait to see the finished project! really interesting concept eoin looking forward to seeing it develop. what ave you got on the tower? a 6 pounder or a cannon? ;p R.
Its a 'Medium Cannon' as described on the packet- acquired from Mr Bracken. still got its wheels on! the cannon put on the top of these towers had a timber cradle and timber beams to allow the cannon to rotate on a steel track built into the roof perimeter step, the back of the cannon pivoting on a central up-stand. That's absolutely amazing looking structure!! I'll have a smaller bridge, one track, for the table. Otherwise Seapoint Avenue would be hanging over the edge! The cannon used on the Martello Towers was a 24 pounder. ...and the timber beams carrying the cannon pivoted on a central up-stand, but! there is also a central track on the same up-stand, the beams pass the pivot point to support wheels under them, the wheels run on a steel track around the perimeter of the central up-stand. Looks good so far... another thread to keep a close eye on! Definitely what the Yanks call a signature structure, not sure how effective they would have been if there had of been in the face of a large scale invasion. The tower that the name comes from 'Mortella' in Corsica was quite effective, the British Navy attacked it on two occasions in 1794. The first attack lasted two hours until the French ran away, the second time- 3 months later, after the French rebuilt and rearmed it. This time not easy, it took two days and the loss of 1&1/2 British ships, not quite out but had to withdraw. Eventually they took it from the land, setting fire to the base the French called for quarter, they found 33 men manned the tower and only two of them were killed. So annoyed they had to take it a second time, after measuring it up they blew it up. The British Army Engineers were so impressed with the tower's effectiveness they adopted its design and started to install them, hence we have them on our coastline to protect Dublin- where the British Navy used to hang out when not off blowing stuff up. Most of the Towers on our coast had a gun battery also, with up to 3 cannon installed- Tower 14 Seapoint did not. The main reason for them was to attack a landing force from the sea and the British Navy felt South of Dublin was the more likely location and erected the towers closer together than on the North side. The towers were within cannon range of each other and could protect landing points between with cannon cross fire. 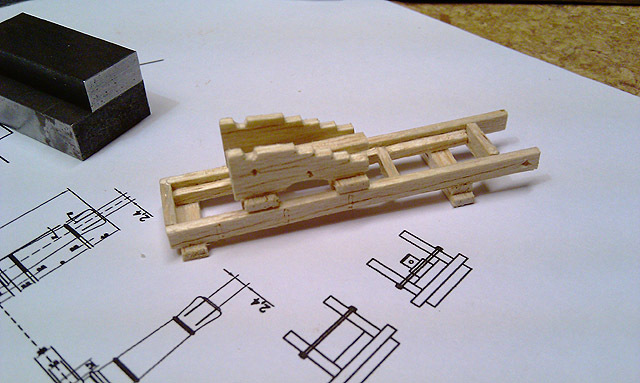 I decided to construct this one in balsa to have a timber look finish, just needs slight stain and coats of varnish. There is a lot of info, drawings and photos out there on 24lb cannons. 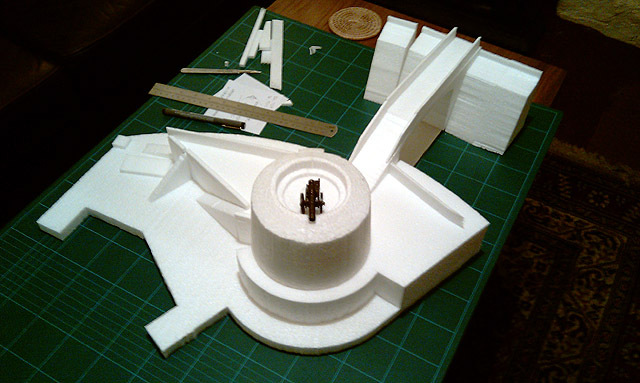 I found a few and prepared a drawing, my version of a Martello Tower cannon and cradle. 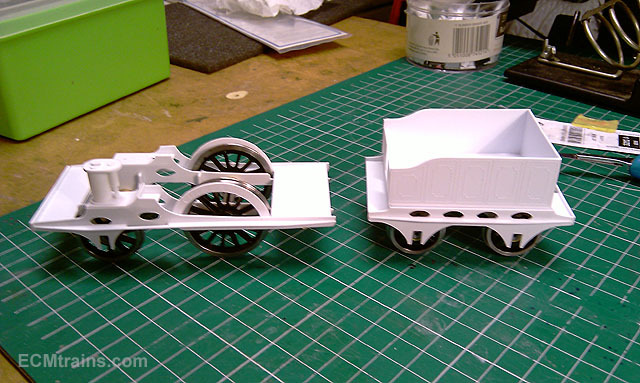 The trolley is just like a ships one except the wheels are removed and skids attached. 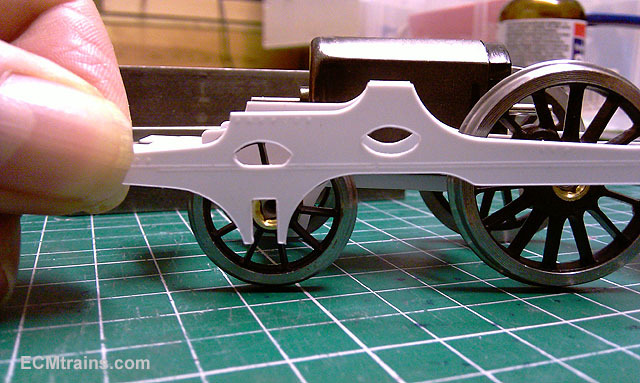 These skids interlock in a track on the cradle and the cannon could be pulled back on its trolley to reload and then forward to fire. Reverse motion was assisted by a pulley wheel mounted on the end of the cradle between the beams. Forward motion was assisted by pulley blocks fixed to rings mounted on the internal face of the parapet. I reckon they would have had one on each side, so to assist in horizontally lining up the gun with the target. 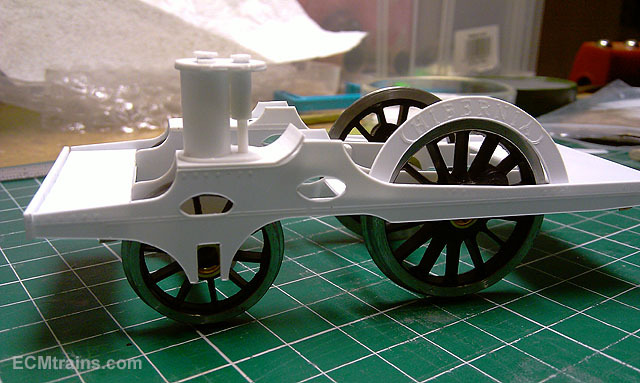 Next the cannon barrel- a bit of aluminium to be turned! Here is a project I have been working on for a long, long time! 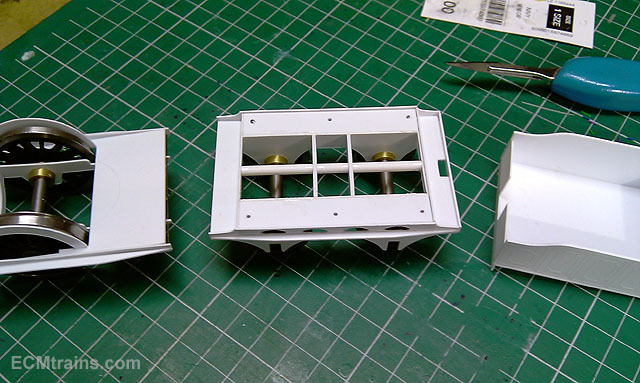 But it is now finally coming together as you can see from the attached photos of a test build of the chassis in plastic card. The Hibernia was one of the first loco's to run in Ireland on the Dublin & Kingstown Railway in the 1830's, it was built by Sharp Roberts & Company in Manchester from a Roberts earlier design loco called 'The Experiment' . 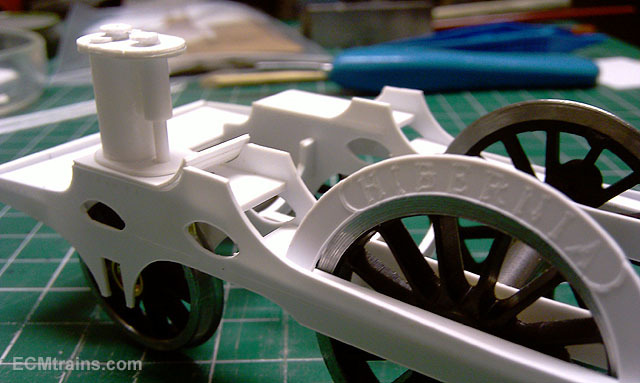 The first design was unsuccessful, mainly due to the vertical cylinders & bell-crank drive design pounding the track and rattling the engine to bits. Unfortunately these design failures were past on to the Hibernia and two other engines;- Britannia, and Manchester bought by the D&KR directors, much against recommendations by some of the engineers advising the company. But the loco's came at an economical price tag. I reckon Sharp Roberts had a box of scarps hanging around in a dark corner of the workshop, remnants of the ill fated Roberts Experiment, and found a way of offloading the box for a fee. The Hibernia after 8 years of troubled service decided to commit suicide, so while the engine-men were attending to their own servicing- it blew up. This prompted the D&KR to have the two remaining engines of this type inspected and overhauled, but they were sold a year and four years later. When I first saw a drawing of the Hibernia some 30 years ago I was fascinated, it's curved cast iron chassis, vertical cylinders, mad looking bell-crank drive arrangement, and side railings- typically Victorian and alike a horse drawn coach design. I love it. Back then I set about researching the loco and collecting what information I could, there are no photos (cameras did not exist at that time), side view drawings are all that I could find and even these turned out to be incorrect, though through perseverance and many discussions about this type of early loco design I eventually completed a full drawing spec. 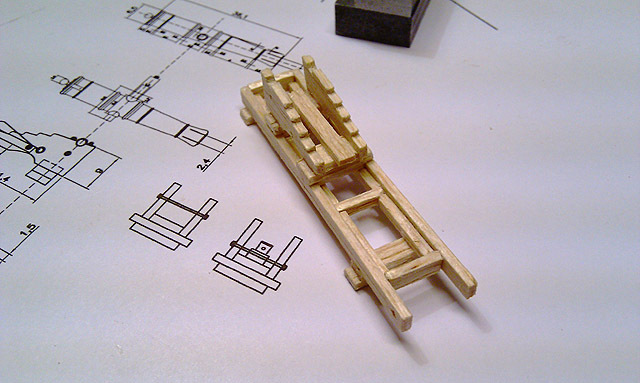 The pictures are of an O Gauge test chassis model, just erected in the last week, this test assists in getting the brass work drawing correct for etching the parts and see where there may be trouble assembling the model. 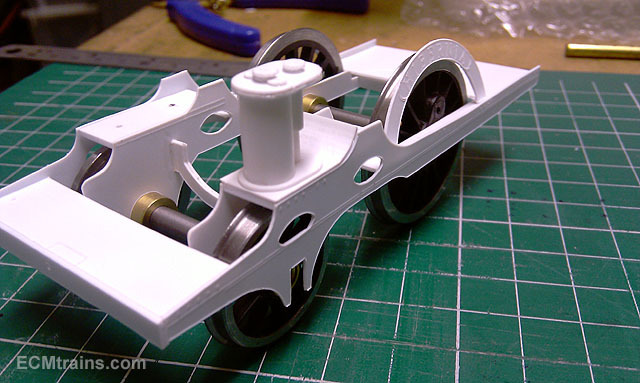 The ultimate goal of this project is to build a working live steam 3.5'' Gauge model, hopefully in less time it has taken me to get to this stage. Can't wait to see her complete in 3 1/2" gauge, you'll have to bring it down to Cultra and give it a spin once she's complete. Nice one, looking forward to seeing it progress! Wow! Martello Towers and Hibernia 11/10 for originality! I'll look forward to seeing them all, it's the same with us, our 7 1/4" gauge Bridget is undergoing safety valve repairs, and our 3 1/2" gauge tich is also under repair, all of these take time and need precise care, take it nice and easy. Lovely work Eoin, it's going to look great when it's finished. Just noticed Hibernia engraved? in the splasher marvellous stuff. 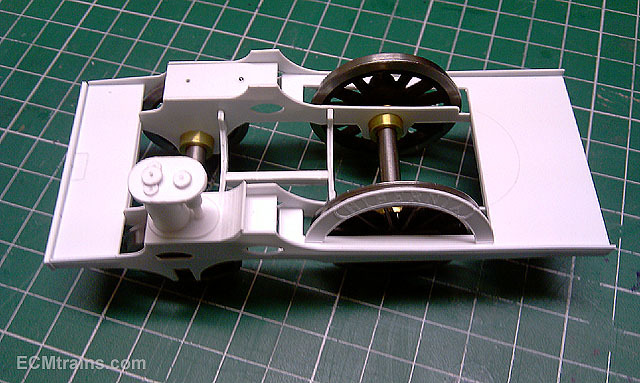 Modelling the early railways may be becoming fashionable there was a recent thread in RM Web about the build of a OO gauge mode of a Liverpool and Manchester 0-4-0 with a motor in the tender with a carden shaft drive to the loco. Very smooth running but looked odd shunting BR steam era rolling stock. There was model of Hibernia made a long time ago by someone whose bag was early locos. 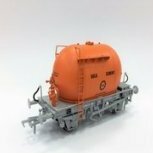 Saw it on a Railway Modeller, think it was around the 1980's and was in 4mm scale. 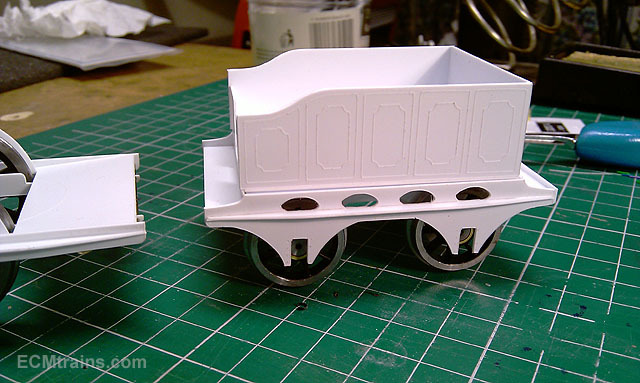 This baby will be shunting her own rolling stock- 3 carriages are planned, one first class which looks like a stage coach and two third class, one will be enclosed and one open to the elements. An enclosed carriage still exists and is on display up north. 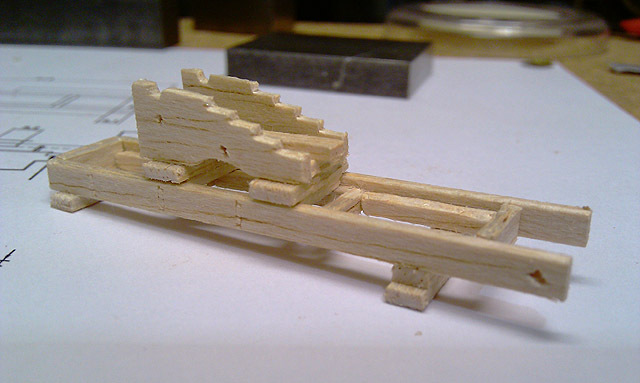 There is an OO gauge one planned but I thought it would be easier to develop the design of the model in O gauge first. Mr & Mrs Fry built one which still exists in the Fry Collection, I tried to get a look at it while preparing my drawings but to no avail. It'll be good to see a Martello tower with no graffiti! Totally correct, Eoin. It's ghastly. 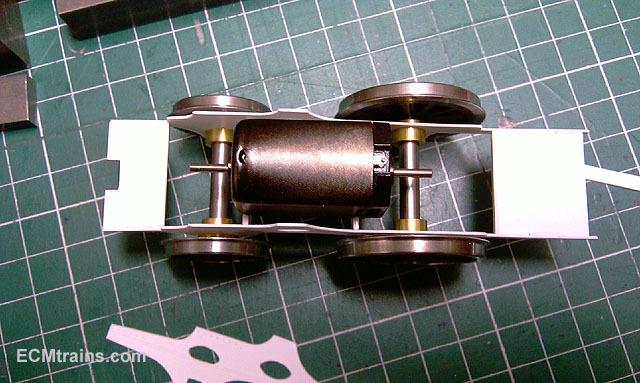 Here is a slide show motion study of the Bell-Crank and Drive Rod. 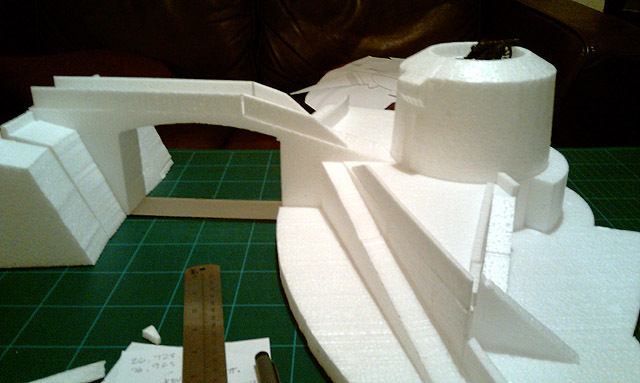 Prepared from screen captures of the drawing for the loco model. 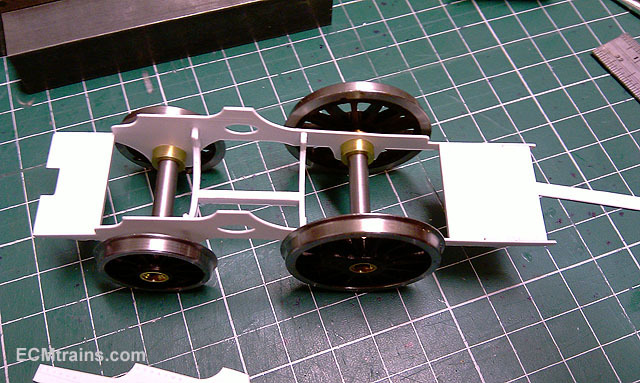 It was prepared to prove the crank and rod would not foul the chassis. It's a mad looking thing- one of the main features that attracted me to the locomotive. Brilliant project. Your ability to manipulate plastic is spectacular. Truly inspiring.